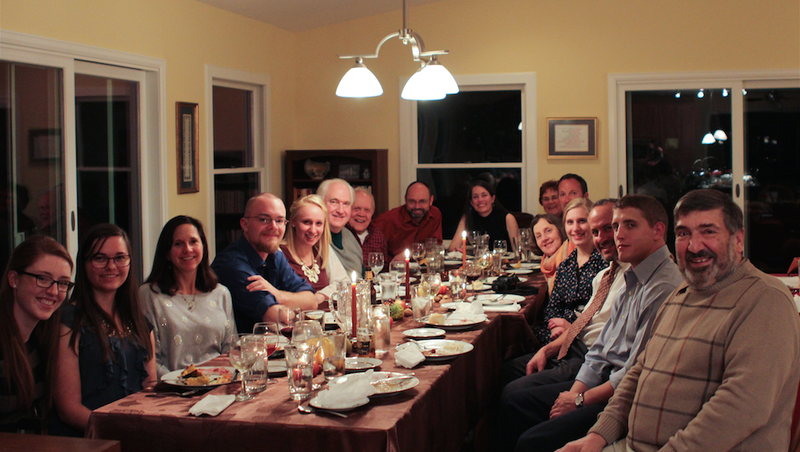 A full table at John and Katherine Brophy’s home in Colorado Springs. By Anne Osterhouse and Elizabeth Grams. Photos by Laura Kane, Evan Lent, Abby Earhart, Stephen Buch, Liz Cole and Emily Hagens. In Evansville, preparations began on Wednesday, as missionary sisters cooked up a storm in the kitchen, along with several women and girls from the neighborhood. “Rather than doing a potluck, we asked people to bring their own ingredients and then we cooked together,” says Chris Vieck. They made nine pies—six pumpkin and three pecan—as well as 25 mini-pecan pies and two 9x13 pans of a strawberry dessert with a pretzel crust. At 7:30 on Thursday morning, missionaries John Earhart and Nick Holovaty began deep-frying six turkeys, one by one, in the backyard. Community sisters peeled, cut, boiled and mashed 50 pounds of potatoes. The food preparation made use of ovens and refrigerators in five different houses of community members. At 1:00 p.m., 39 people gathered for prayer before splitting into two houses to eat. Attendees included 14 of the missionaries, Casey and Carrie Johnson’s family, twelve neighbors, Claire and Anne Raway (Indianapolis), Chris, Geriann and Mary Raway and Elizabeth Pease (Servant Branch), and Nick Raway, Joe Bulger and David Zimmel (Allendale). After dinner, the group sang old Gospel hymns and new praise songs of their own. 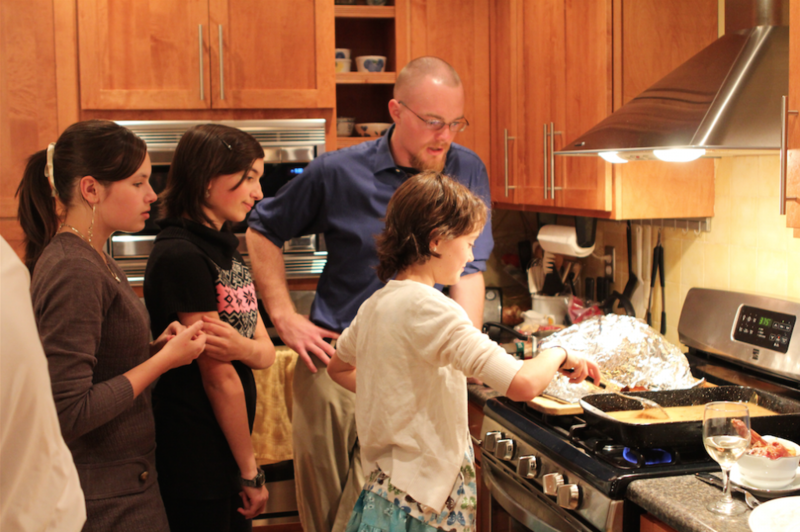 In 2008, John and Katherine Brophy invited Bren and Karen Triplett’s family (all Colorado Springs) for Thanksgiving, since neither the Brophys nor the Tripletts had family in the area. 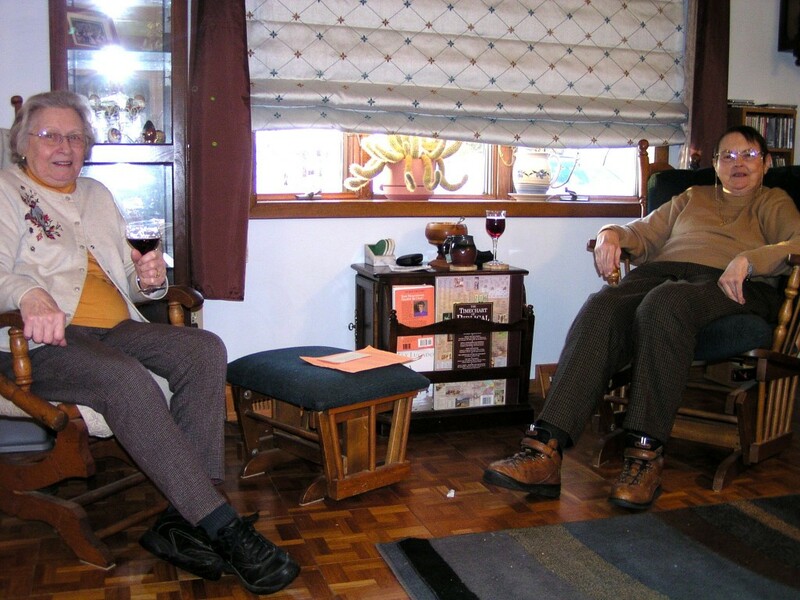 The two families have gathered at the Brophys’ every year since then. This year, John’s parents Tom and Jackie Brophy (Tampa) also came, along with John and Maria Elliot, their daughter Kathryn (all northern Virginia) and their daughter Jane, who teaches at Thomas MacLaren School. Branch members Mark Elio, Jon Grams and Laura Kane, MacLaren teacher Josh Kelly and a friend of John Brophy who is new to the area, also joined them. The guests included many transplants to the area from other parts of the US, as well as from Mexico, Lebanon, Ethiopia and Jamaica. The food included traditional fare along with ethnic dishes from around the world. Ramona Castro, who is originally from Mexico, brought homemade guacamole and salsa. Suad Sbait, from Lebanon, brought a cauliflower dish broiled with Indian spices. Yodit Derese brought an Ethiopian dish. 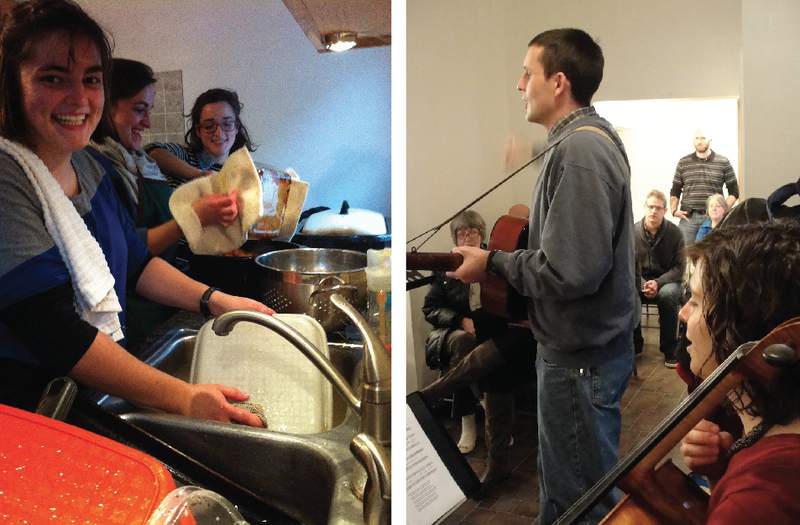 An open mic was the source of some hearty Thanksgiving-themed laughs. Pat Clark told a variety of jokes (How come the pilgrims had trouble holding up their pants? Because their buckles were on their hats!). 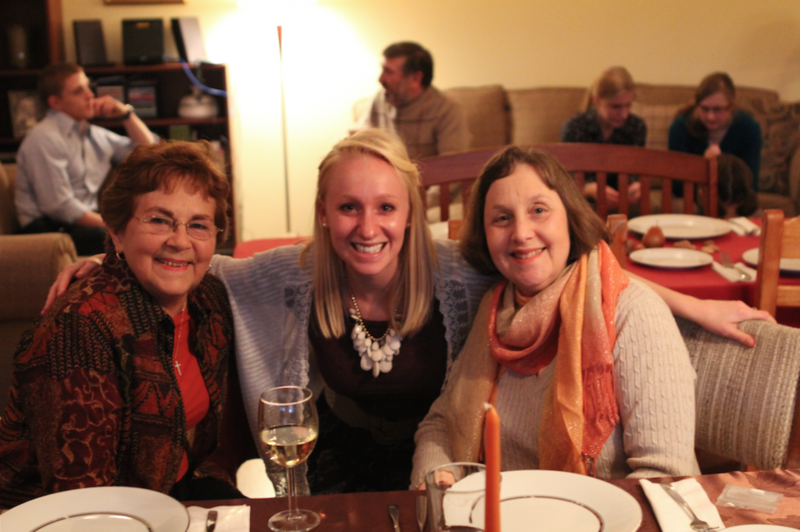 Martha Olson and Joanna Robinson collaborated on a Thanksgiving rap. 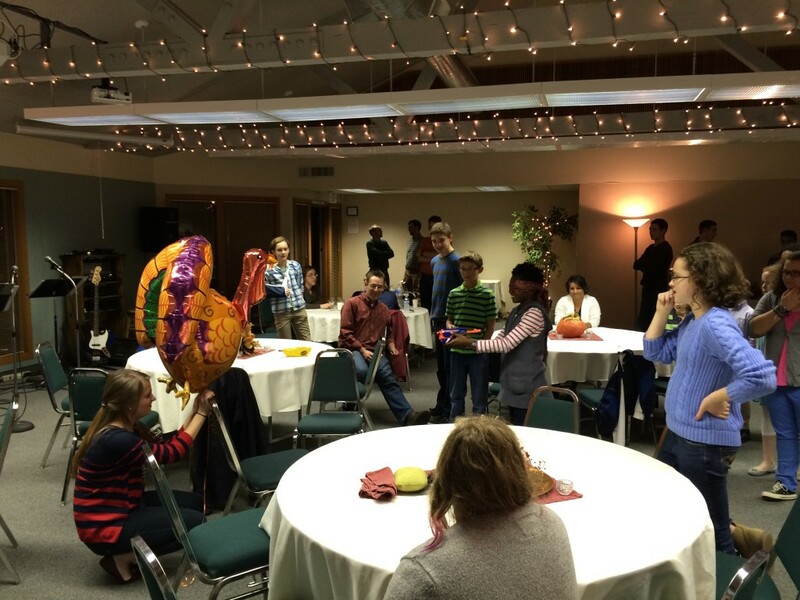 After dinner, the children played a game with a large turkey balloon. 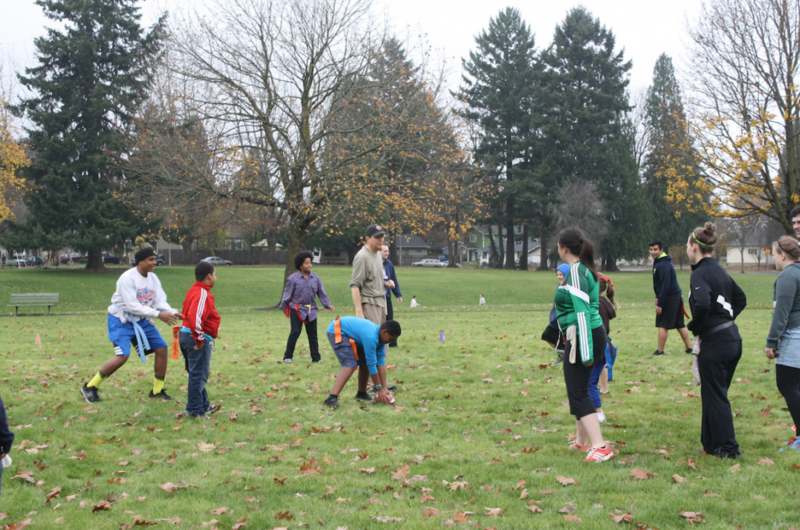 One person held the balloon, while a child was blindfolded and armed with a nerf gun. The turkey roved around the room, “gobbling,” while the child tried to shoot it. Peter and Stephen Kabele and Carlos Castro made the game more interesting by setting up obstacles. Great articles! So much to be thankful for. God is good - All the time! It is wonderful to see that household living and extended family gatherings for special holiday meals such as Thanksgiving is still very much alive and well! God bless you all and our rich life together in community. I so enjoyed picturing all of you having Thanksgiving dinner together. The idea of cooking together was a great idea, but I don't know how you organized it! God bless you! "God bless us every one"
I loved reading about the different celebrations, and seeing the photos. So upbuilding - the Lord is so good!